ThisTjjjjj_ Th This system was designed as a compact and easy to use method for recycling household food waste back into a useable product. Wether you purchased or grew the food yourself you can now recycle every last bit so it does not end up in the landfill. 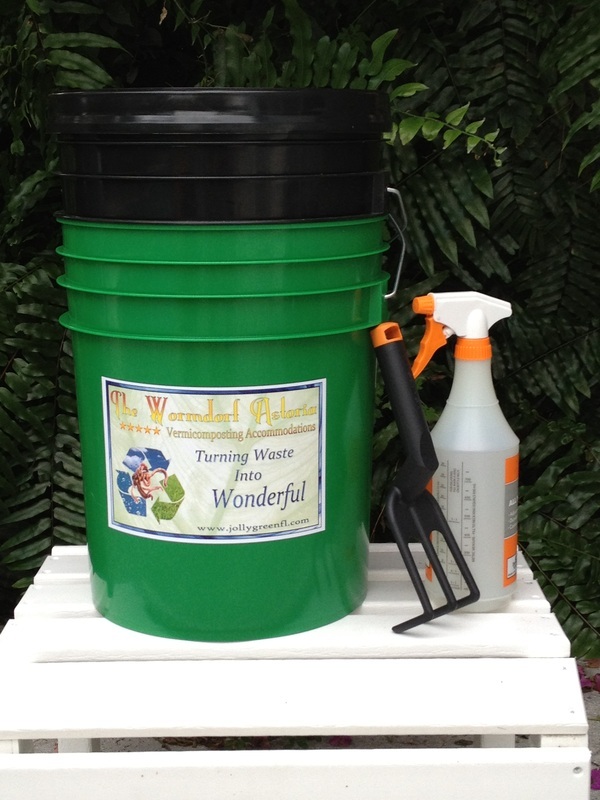 The Wormdorf Astoria is a two bucket system which uses Red Wiggler worms to convert your organic food waste into "vermicompost" or "worm castings", and also capture the liquid waste or "worm tea" for use on your plants. The black "Housing Bucket" is designed to provide a dark environment for your worms. It has an easy open sealed lid to help retain moisture and prevent unwanted pests. Our current design incorporates screened vents for proper oxygenation and air flow. An internal raised bottom allows for excess moisture or "worm tea" to easily drain out without clogging the drain holes. The green "Catch Bucket" provides a clean and convenient way to capture the worm tea which easily drains from the upper bucket. First remove the Housing Bucket from the Catch Bucket. Then simply dilute the worm tea by adding a few gallons of water (rainwater preferably) to the bucket and pour onto your plants for some added nutrients. By utilizing organic systems in place in nature for millions of years we can easily eliminate a huge portion household food waste from municipal landfills. Not only will this help reduce greenhouse gases, but it may also benefit you financially. Many cities are charging for waste removal by the weight of the container. The end product of recycling food waste is very beneficial as a soil amendment aiding in improved soil health and reducing watering needs. It is also packed with vital nutrients and beneficial bacteria reducing the need for synthetic fertilizers and toxic pesticides. The Wormdorf Astoria is a vermicomposting system. This means it uses worms to help break down the food waste. The end product is called worm castings (worm poop). These casting are a great source of nutrients for your plants both indoors and out. The casting also contain beneficial bacteria that will help your garden soil. The castings can also be used to brew a compost tea which can be sprayed on your plants and poured around your garden. The same food scraps that you may have been sending to the landfill can now be put right back into the earth from which they came completing the cycle. In essence you are getting more out of your grocery bill dollar.